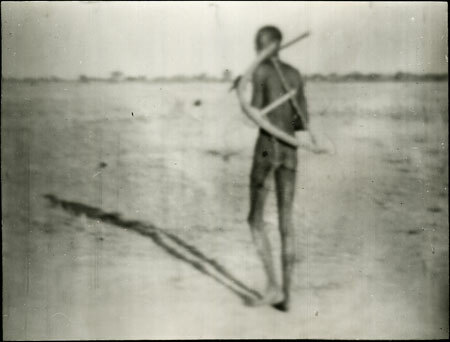 A Dinka man setting out towards a game path with an animal trap (dang) on his back, consisting of a wooden frame with rope [poor image]. The Powell-Cotton's collected this trap, perhaps from the individual in this image, on the 3rd May 1933, and donated it to the Pitt Rivers Museum. It is likely that this print is a still taken from the cine-film made by Powell-Cotton during this expedition. Notes on print reverse Ms pencil - "No 1. Dinka Animal Trap. Going to the game path, Fanamweir, Sudan 1933"
Morton, Chris. "Dinka man with animal trap" Southern Sudan Project (in development). 03 Jan. 2006. Pitt Rivers Museum. <http://southernsudan.prm.ox.ac.uk/details/1998.207.3.1/>.